Muslim students were concerned that the ban would affect women wearing the face veil. (CNN) -- A Massachusetts college has modified a controversial security policy after criticism it infringed on the religious rights of students, a school official said Friday. The policy originally banned any head covering that obscured the student's face while engaged in student activities. The Massachusetts College of Pharmacy and Health Sciences e-mailed students about the initial changes this week, saying, "Any head covering that obscures a student's face may not be worn, either on campus or at clinical sites, except when required for medical reasons." School officials said the policy was intended to ensure that all students would be identifiable "for reasons of safety and security." But on Thursday, the policy was changed to include an exception "for medical and/or religious reasons." The original policy had prompted questions and concerns among Muslim students and organizations, particularly because it meant Muslim women at the college could no longer wear the niqab, or face veil. The college -- with campuses in Boston and Worcester, Massachusetts, as well as Manchester, New Hampshire -- stated that the initial modification was "based on a constructive dialogue with our extended community, and an intensive review of safety and security measures with advisors." College spokesman Michael Ratty said, "We will achieve our objective of campus security while allowing for a medical and/or religious accommodation. As always, our primary concern is the security and safety of all our students, faculty and staff." Ratty stressed that Muslims were involved in the original policy decision saying, "Prior to implementation, the college discussed it with several officials within the Muslim community." Muslim students had mixed reactions to the original ban. Aisha Bajwa, president of the Muslim Students Association at the college, called the unmodified policy "unjustified and unconstitutional." Bajwa, who does not wear the niqab, said that having to wear student IDs at all times keeps students safe. Ibrahim Hooper, communications director for the Council on American-Islamic Relations, thinks the policy targeted Muslim students and filed a third-party complaint with the Equal Employment Opportunity Commission. Writing to the commission, the Council invoked Title VII of the Civil Rights Act of 1964, which prohibits employers from discriminating based on religion. Hooper acknowledged that the college's policy focuses on students but said it will inevitably target Muslim employees in the future. After the complaint, George Humphrey, the vice president for College Relations, e-mailed Hooper, announcing the new policy. "We have reviewed our ID policy and made an accommodation for religious reasons," the e-mail said. "Thank you for your input on this matter." Hooper then stated, "We are pleased that the religious rights of all students and staff will now be protected. This is a victory for religious freedom and tolerance." Ratty said, "The complaint was not the sole reason for the reversal but rather an ongoing discussion this week with our community." Daniel Pipes, director of the Middle East Forum, supported the original policy. Though Pipes acknowledged the larger cultural debate, he said the college is focusing on security. 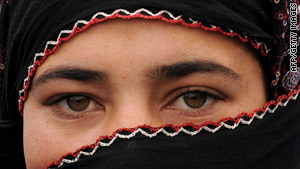 "I have documented dozens and dozens of cases about criminality and terrorism that have been abetted by burqas and niqabs," he said. "It is sensible to ban these, and there are a number of these bans in institutions such as banks or jewelry stores." With increasing concern about terrorist attacks, religious practices will have to be weighed against security, Pipes said. "In Turkey, the hijab has been banned from government offices, so this is not something that is just an American concern," he added.